An urgent and provocative account of the modern ‘militant’, a transformative figure at the front line of emancipatory politics. Around the world, recent events have seen the creation of a radical phalanx comprising students, the young, workers and immigrants. It is Badiou’s contention that the politics of such militants should condition the tasks of philosophy, even as philosophy clarifies the truth of our political condition. To resolve the conflicts between politics, philosophy and democracy, Badiou argues for a resurgent communism – returning to the original call for universal emancipation and organizing for militant struggle. SR: Let’s begin with politics. Recently we have seen big protests across the United States sparked by repeated instances of the police murdering unarmed African Americans with impunity. You’ve been a longstanding and vocal opponent of racism and police violence in France. Do you see parallels between the situation in the two countries? Alain Badiou: There is certainly something similar between the two situations, because in France, too, there is a racist dimension in the actions of the police. In our large suburbs outside the big cities, many workers and their families come from Africa, are Blacks and Arabs, and it has been statistically proven that if you are Black or Arab you are six or seven more likely to be arrested by the police than if you are white, often for the same charge. We also have many cases of killings by the police in the suburbs. And we have, as well, the fact that in practically every instance there has been no sanction at the level of official justice against the actions of the police. All that is, of course, similar to what happens here. Except that in the United States the problem goes back a longer time, to slavery—it is a structural problem which is part of the entire history of the country since its beginning. A few observations. The president of your country is Black. Now, clearly, there is no direct relationship between Obama and the recent police killings—I am not suggesting that. But it seems to me that there is perhaps a symbolic relation. But that is also contradictory. On one hand, we can interpret the fact that the police killings take place under a president who is Black as the expression of a fundamental racism against Black people. On the other hand, it is not the case, Obama’s election points to a different reality. And so my conviction is that there is a strict necessity to have big demonstrations, to mobilize and revolt against these outrages. In France the response has been far too weak. I hope that in the United States the reaction will be much stronger. That is what I hope. ISR: Another dimension of contemporary racism in both countries is Islamophobia. In France this has taken both a legal and political form—for example, the law banning the hijab passed in 2010 and, more recently, this past May a substantial vote for the far-right National Front in the European parliamentary elections. What are your views on this? Do you see the National Front as a real threat? A.B. : You know, the existence in France of a strong current against Muslims is the result of many factors. The first one is colonialism. In the not very distant past, we had the Algerian War, a colonial war against the Algerian people. So the first cause of racism against Arabs and Muslims is of an ideological nature. It is a racism that can be traced back to colonialism, this feeling of the superiority of the Western world. Likewise, the superiority of the “native” against the immigrant, and in France there is also a religious dimension of Christian superiority over Muslims. And French intellectuals, including well-known intellectuals, participate in this campaign against Muslims. In Le Figaro and elsewhere you can read it; this is an intellectual trend. The laws of which you speak are in my view illegal laws, because they are laws of persecution, segregation, and apartheid. They are the result of this strong ideological trend coming from the colonial past and also from the ideological confusion in France in recent years. But there is something else, which is the social contradiction. After the war, we had a great number of workers coming into the factories in France, and these workers were in their majority Arabs and Muslims. The great majority of Arab and African workers are poor people who live in very difficult conditions in the suburbs. They are segregated because most white workers don’t—and often refuse to—live in the same neighborhoods. So we have a mix between something of a racist, ideological nature and something of a social nature: a mix of ideological tradition in the reactionary sense, and something which takes the classic form of class struggle. And it is this mixture that creates a very difficult situation for Arabs and Muslims. And so I believe it is necessary to organize a very strong resistance not only against the state, but also against the ideological currents, including the National Front. ISR: In France there is also a particular articulation of this racial and religious chauvinism, isn’t there? The Republican tradition is often invoked to legitimize it. A.B. : Absolutely. It’s a specific French point. The French term is “laïcité.” In the Republican tradition, the tradition of the Enlightenment of the eighteenth century, the word was used in its classical form against religion. It is used today to create a “neutral” secular position. But of course it is not at all a neutral position because it is used only against Muslims. There are no laws targeted as such at Christians or Jews. But there are many laws, decrees, and decisions specifically aimed against Muslims. And Islam, you must remember, is in our country a religion of the poor. We have to defend the true Republican tradition from this unacceptable misuse. We must insist on the fact that education is for everyone. You can have religious education, of course, but the first principle is that education must be for everyone. Therefore, that the Republican tradition would be used to deprive young women of any form of education is absolutely unacceptable. Even if you take the Republican tradition in its precise sense, the exclusion from education is a scandal. A law that excludes a woman or girl from education because of a piece of clothing she wears, on the basis that it “paralyzes” education, could that be the Republican tradition? No, it is a law of apartheid and social repression. 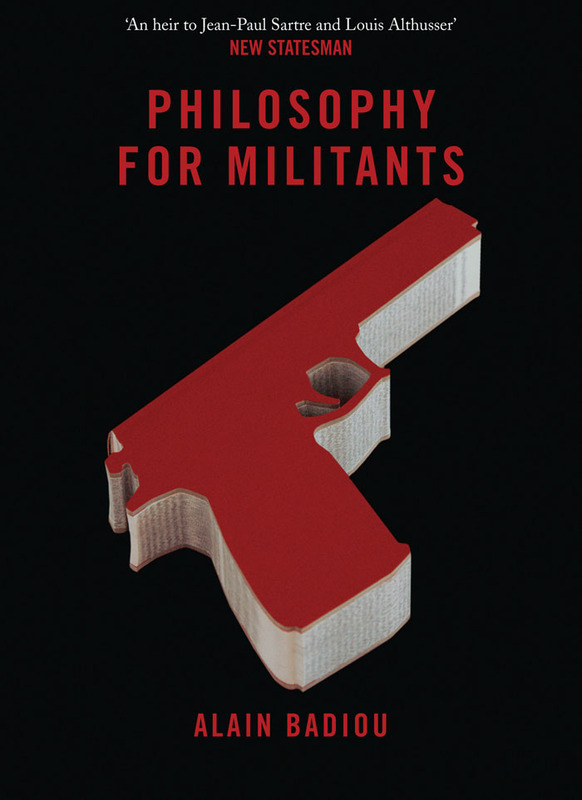 ISR: You have written a short book published in English this past year entitled Philosophy for Militants. Why should radical political activists today pay attention to philosophy? A.B. : You know, there has been a long history. If you think of the situation in the nineteenth century, you have many philosophers who were public intellectuals, who took public positions on many issues: against torture and repression, in support of prisoners, and many others. So the idea that there exists a relationship between philosophical convictions and political action has been true from the nineteenth century until today. In the Marxist legacy, there has always been a relationship, even if sometimes difficult and controversial, between dialectical philosophy—coming from Hegel and Marx—and political determination. And I think that this point is especially important today, because in the present moment there is a general weakness of revolutionary ideas. And so, when men and women today engage in political action they are in search of an orientation. What is a political orientation today? With the failure of the old communism, with the development of neoliberalism, with the rise of an authoritarian-capitalist China, it remains an open question. The new wars today, the imperialist occupations of Iraq and Afghanistan, too, are complex—there is no clear case of the “good” against the “evil.” In this situation, to find some clear points of orientation, some common principles for action, is a necessity. That is why many people interested in philosophy today are looking for a general orientation toward political life, and that the question of a general orientation is obscure is not surprising. It is not so much the question of immediate struggles which is obscure. In many cases it is not. For instance, that you should struggle against racist police violence is clear. But of course in the long-term it is not enough to defend a purely negative indignation. You must have some principles, some positive will, an affirmative determination. So, finally, in this present obscurity, the search for light by way of philosophy is normal. Of course it may be difficult for philosophy to give a clear answer to these demands, but that is its problem. ISR: On the subject of political orientation, you have argued for a renewal of the idea of communism, and for a new communist politics. Why have you chosen to do so, given the contradictions and, indeed, the terrible crimes associated with the term? A.B. : Of course I am well aware of all the disadvantages of the word communism. But on the other hand, communism has been the only historical attempt to unify a vision of the future in a way that is clearly and absolutely opposed to capitalism. And after all, the world as it is today exists under the rule of capitalism, a globalized capitalism. And as we know, all the different political forms in this world, including the democratic states, exist under the rule of capital. So I am aware of the disadvantages, but all the political names are in a sense compromised, last but not least democracy. George W. Bush called himself a democrat. Sarkozy was a democrat. Everybody pretends to be a democrat. So in its accepted meaning democracy is in no way clearer than communism. But to renew communism means to begin to renew a political opposition against the capitalist system. Communism is a correct name for that. We have what I call the three stages in the history of communism. The first stage is the invention of the concept and its formalization with the rise of Marxism; the second, the history of the communist states of the last century—the revolution in Russia, the revolution in China. And I propose to say that we are beginning a third stage of communism which is neither the birth of the idea, nor the failure of the first attempt to realize the idea. When you say communism, many people say immediately, “that means Stalinism!” Once again the question of compromised names! The French president calls himself a socialist, but as we know there is absolutely nothing socialist about him. The word communism possesses the advantages of its difficulty, that is, the radical failure of past attempts. But even in its failure, you have the impossibility of confusion between communism and capitalism. And I don’t know any other word that can signify anything like that. Therefore I propose this name as a very general orientation, which includes many different forms of political action, which are not under the law of private property, financial oligarchy, and so on. I know the risk. If someone proposes a better name, no problem, I’m willing to accept a different name if it means a movement in total opposition to capitalism. ISR: There is also a dissident communist, revolutionary socialist tradition which has always maintained a principled opposition to both Western capitalism and Stalinism in its various forms. Do you think this dissident tradition can help us renew a relevant revolutionary politics today? A.B. : Absolutely. I think that naturally if we are to think through a new definition of communism today, we also have, in the past, all the attempts made under the name of communism—and finally, all the ones which were associated with communist organizations—to give to the word communism another meaning, another sense than did the Stalinist tradition. You had, for instance, the organization Socialism or Barbarism in France. Also Trotskyism, and interpretations of Maoism. And also some figures within anarchism who resisted the hegemony of the dominant tradition of communism in the twentieth century. They are all within the scope of our meditation. ISR: Many people radicalizing today, especially young people, are suspicious of politics, of the party form, but also of political representation and leadership as such. Yet it’s obvious to many that there is a need for greater strategic and tactical coherence in the movements. How do we begin to tackle this problem? A.B. : If I only knew! It’s an open question. But we can develop a clear notion of the problem. And today the problem is not the question of revolt, or of the mass movement by itself. We have had over the last few years many uprisings, many revolts, many mass movements: in Egypt and throughout the Middle East, in South Korea, in Turkey, Brazil, China, even today in the United States. There is a new planetary situation. For me it is something like the 1960s; that is, the beginning of the 1960s. The movement against the Vietnam War, for civil rights, the very beginning of strikes in the factories, etc. etc. We had the same feeling then of the possibility of great revolts and a mass movement as we have today. The difficulty in politics today is not that people do nothing; that is not the case. We are certainly still in a great reactionary time. But it’s not true to say that in a practical sense everybody is inert. There have been real mass movements. Therefore, the question for us today is not the question of revolt, negation, or uprising against the world as it is. The new generation in particular has shown itself capable of that. The problem is that what we name “politics” in the classical sense, that is, the world of parties and of the classical political institutions, seems, for the young in particular, to pertain to an old world, not really active in the contemporary world. And this raises two difficult points. The first is ideology. We don’t have a clear and commonly shared idea of what we want. Clear is what we do not want, less clear is what we do want. So a discussion of an ideological nature takes place between philosophy and political determination, between ethical principles and political engagement. It is a discussion very similar to the discussions that took place in the nineteenth century. I say very often that we have returned to a situation that recalls the middle of the nineteenth century more than the last century. It is a sequence where we need new political ideas, new means to analyze the situation, that is the first point. We have a need for new studies in the economic and ecological fields. But this discussion will create a light in an obscure time, on this point I am optimistic. The second point concerns the form of the political organization. Many people agree that we need an organization that is “near” to the movement, a political organization. And this organization is necessary not only to organize revolt, but to organize time, a new political time. Because before us stands the state, and the state has in a sense all the time it needs. So an important question today is: How can we organize a new political time? ISR: In Philosophy for Militants you seem dismissive, though, of what you call the “classical revolutionary tradition.” But isn’t the task for revolutionaries today not to abandon this tradition, with its aim of abolishing capitalism and the state, but to renew it at both a theoretical and practical level? A.B. : The question of organization seems to be really an obscure, a difficult question. That is to say: How is it possible to proceed, beyond revolt and the uprising of the mass movements– with their demand for structures of horizontalism and their taste for big assemblies—to the organization of political time, to the capacity to know how to make progress on the political field. The question of political organization is and probably always has been the most difficult one in politics. We can study its history, this history of spontaneous revolts, of classical parties, of Leninist parties, of parties fighting for national liberation, etc. etc. When one speaks of the classical revolutionary tradition, one thinks generally of the conviction that the center of any political activity is in fact revolution, which means to take the power, to destroy the old power. ISR: A very unfashionable idea on the Left today. A.B. : Yes. And we know now, what we didn’t know at the end of the nineteenth century, that the difficulty lies not simply in revolution as such, but in what comes after. It’s a profound and decisive lesson. When I criticize the classical revolutionary tradition it is not from the perspective that it should be bad to take power and to destroy the potency of the enemy. Not at all, naturally. But I know that the difficulty lies afterward, in the general failure to establish a new political will by the strict political means of state power. On the whole we are contemporaries of a new fact: revolutions have existed, victorious revolutions have taken place, no doubt about that, but we know also that the construction of a new society by means of new forms of power have been historically a failure. We can’t simply repeat the past. Our task is to rethink once more the same problem: how is it possible to destroy the state power of the enemy and to produce a new power? In fact it was an original formulation of the Marxist idea, found in Marx himself, that we must take the power. But after the Paris Commune Marx himself argued that we must destroy the whole state power, not only that of the enemy, but every form of state power. So one must organize the disappearance, the vanishing of the state. What we have now learned is that it is impossible to organize a progressive end to the state by means of the state. And so it’s now, and not later, that we must imagine that new power. What would it look like? The new power must develop a close relationship between state power and the mass movement, something like that. And this new form of positive dialectics between state power and the mass movement is the question of organization. Because to make it a reality, the politics of the future must have three terms. The classical party-state had just one: state power, but the politics of the future must have three terms: state power, the mass movement, and political organization, which is neither reducible to the mass movement—because it must also construct a new political time—nor to the state. Therefore I think that we have to create a political situation where we will be able to have a movement, a dialectical movement, of the three terms. And I am suspicious of all political forms that involve a reduction of any of the three terms. For example, a mass movement without any state leads to classical anarchy, or, if the state is reduced to something without the mass movement you have again the “classical” party. So formally the question is how to propose a dialectics which is not a dialectics between one or two terms, but between the three terms of the political field. ISR: In An Impatient Life, the wonderful memoir by your friend, the late Daniel Bensaïd, he discusses how a political campaign has been waged in France against the radical legacy of May 1968—an effort to defame and caricature the events of that year. What, in your view, is the authentic legacy of 1968, and why should radicals oriented to the future be interested in defending it? A.B. : I can explicitly answer your question. The novelty of 1968 was not simply the existence of strong movements within education and among the youth. Because something like that existed in practically every country in the world at the same time. Nor was it the existence of the most important general strike of workers in the country. Because, for example, we had seen in France something like that in 1936. The novelty was the connection between the two. It was completely new because even the Communist Party was opposed to the coexistence of the two movements. In the Communist Party the workers were organized absolutely apart from the radical intellectuals, and only the party could mediate the relationship between the two. ISR: Your participation meant a break from the party, and from your mentor Louis Althusser. A.B. : Yes, absolutely, and it was a violent separation. The novelty of 1968 was the possibility of the organization and the realization—and I participated in the events very concretely—of a direct relationship between the two movements. This meant going to the factories, discussing with workers, and creating a form of popular unity of a real new type, which had had no existence in the country before. And after that there was the attempt to create, in this new element, a new form of politics which did not let the party as such have the monopoly of social connection. On the contrary, our attempt was to make it possible that such a social connection be the basis for a new form of organization. Finally, we did all that with enthusiasm, but historically it has not been a success. But that’s not the problem after all. It was like the early nineteenth century, it was a fundamental experimentation. And my idea today has remained the same. If we want to find the way to a new form of organization, it will be attained neither by some purely intellectual means, nor by the separate actions of educated youth, nor by riots of the popular youth in the suburbs, nor by strikes of workers alone. It must be created through a new relationship between all these social struggles. And we must be confident that through this new relationship the new forms of political time and organization can be created. The interview was conducted December 11, 2014, right before the recent killings in Paris at the offices of Charlie Hebdo and a Jewish supermarket. In response to these events, and the wave of Islamophobia and repression that followed, Badiou wrote an article in the French newspaper Le Monde, “The Red and the Tricolor,” which draws attention to the hypocrisy of French nationalism and argues that the cycle of violence between imperialism and extremist currents of Islamism can only be overcome through the “true universalism” of a new communist politics.